Tuxedos, formalwear shoes and accessories. Specializing in Episode 1 figures, ships, and lightsabers. Novelty phones, antiques, metaphysical merchandise, electronics, camping, and tools. Offers custom hockey gloves, sticks, jerseys, pads, and goals. Handcrafted items include painted ceramic tile, italian glass patio tables, and 3D cards. Iowa based seller of a variety of hybrid and species hostas. Repair, re-lacing and restoration of baseball gloves. Game worn player used jerseys, helmets and bats. A small selection of cards for sale or trade. Provides information about organic farming, and listing of local retail outlets. Complete line of new, used and reproduction restoration parts for 1962-1976 Dodge and Plymouth muscle cars. Comprehensive catalog available. Repair and restoration of antique radios, with description of what is done and a pricing guide. Supplier of equipment and supplies for growing orchids indoors and under glass. Products include reverse osmosis and misting systems and controls, fans, soils and fertilizers, and pots. Located in Florida. Shop in New York offers dollhouse kits, components and furniture. Also offers a newsletter and free dollhouse finishing tips. Custom hand-crafted pens, including inlayed, engraved, and scrimshaw pens. Offers equipment and supplies for growing orchids indoors and under glass. Products include reverse osmosis and misting systems and controls, fans, soils and fertilizers, and pots. Accepts online orders, visits by appointment only. Retro and vintage style clothing for men women and kids including bowling shirts, rockabilly clothing, and lounge wear . Specialists in apparel that has been adapted to meet the unique clothing requirements of people in wheelchairs and those suffering from physical limitations. Features both mens and womens clothing. Provider of sustainable biodegradable products including hemp and organic clothing for women, men and children with a focus on green living. Wholesale clothing and retail clothing. Offers natural clothing and accessories, including a wide selection of hemp clothing and organic cotton clothing, recycled pop-bottle fleece, and Merino wool products. One-of-a-kind handmade hippie patchwork clothing, reconstructed clothing, vintage clothing and handmade jewelry. A western clothing store supplying authentic western show apparel, frontier clothing and cowboy clothing. Selling vintage designer clothing, shoes, and accessories, specializing in womens clothing and mens ties. Email to order. Sells clothing for the cannabis culture. Based out of Toronto, Canada. Offers vintage clothing and accessories specializing in leather, suede and 80s clothing. Offers designer clothing and apparel. Large selection of brand names. Clothing, gifts and accessories for girls, boys and moms. Hip hop clothing line inspired by '50 Cent' and produced by Ecko Unlimited. Mens and womens clothing line. Images and sizing information. If the business hours of Jims Clothing in may vary on holidays like Valentine’s Day, Washington’s Birthday, St. Patrick’s Day, Easter, Easter eve and Mother’s day. We display standard opening hours and price ranges in our profile site. We recommend to check out jimsclothing.com for further information. 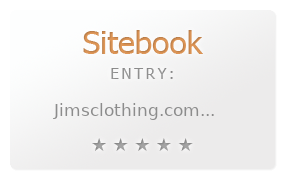 You can also search for Alternatives for jimsclothing.com on our Review Site Sitebook.org All trademarks are the property of their respective owners. If we should delete this entry, please send us a short E-Mail.